Apparently attempting to shed its image as a "scary bar," Meytex Lounge has converted itself into Meytex Cafe, complete with an exterior facelift. The sign looks pretty darn good - as with the bodega on Lincoln Rd., Meytex was able to get the new sign with the assistance of a storefront improvement grant administered by Prospect Lefferts United for Services (PLUS). Meytex has also redesigned their menu - the fried chicken, their best item in our opinion, is now featured. We hear that the inside of Meytex will also recieve a makeover, timeframe tbd. We got excited when we saw that the sign was being taken down from the nasty fried chicken place on Flatbush that we couldn't even hold the camera still, hence the blurry image. We asked one of the guys working on the facade, "is something new moving in?" He said, "Yes. Kennedy Fried Chicken." And our excited quickly faded. A reader sent us an update, complete with photo, on Lime, the yet-to-open bar on Flatbush between Hawthorne and Winthrop. It looks like the place is coming together. We have not heard about any proposed grand opening date - we assume that the owner is still awaiting a liquior license. We're curious to see what the crowd is like at Lime. The owner, Lou, told us that he plans to promote the bar through Trinidadian family members; therefore, the crowd will probably end up being predominantly Carribbean. However, there are tons of young, non-Carribbean folks (black, white, whathaveyou) in the neighborhood looking for hangouts other than K-Dog (no booze) and Enduro (not really a bar, e.g, no standing room). 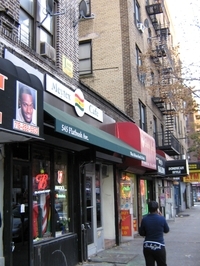 There's nothing wrong with having another Carribbean hangout in the nabe. In our opinion, however, it would be great if Lime ended up attracting a mixed crowd. Looks like there was some sort of bust at Papas & Sons on Wednesday afternoon. Word on the street is that someone in there was running numbers - which is a gambling/lotto ring typically associated with organized crime. We asked one of the check out girls what happened - she said she did not know, which is pretty doubtful, though not surprising that she didn't want to call out anyone's illegal business. No word on whether owner was involved. The place is still open, so probably not. 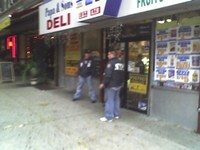 If you hang out in Prospect Park, you probably noticed that the bodega on the corner of Lincoln Rd. and Ocean Ave. received a makeover recently. The store owner and property owner added new gates and awnings with the assistance of Prospect Lefferts United for Services (PLUS). The new paint job looks a lot nicer than the odd mustard hue that once adorned the corner - from what we're told, all of 99 Ocean will be repainted with the new color (tan/salmon wouldn't have been our first choice, but it's a start). Now, if only the proprietors would lose those big ads in the window... looks a little silly to have sun bleached newsprint juxtaposed with sharp new awnings. As this store isn't on our way home, we still have virtually no idea what caliber of groceries they sell. Destruction of an Innocent Stoop? 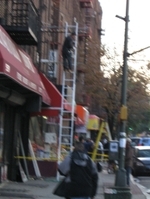 Not too long ago, we received a cry for help from Lefferts Avenue Resident. Via email, LAR told us that, much to her dismay, a neighbor across the street demolished their historic stoop, which may end up lessening the block's historic appeal and aesthetic. Based on the appearance of the now destroyed stoop, it's tough for us to tell what the owners have planned for the entryway. 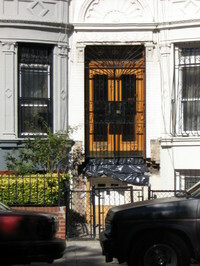 It looks like the door below the stoop was already there - residents would have entered from the side. It's possible that they plan to rebuild according to original specs, but only time will tell. Does LAR have any recourse? Can DOB intervene (no permits posted)? Or Landmarks? The Passing of Michael Hylton, aka "Mike's International"
As many people in the community are aware, PLG just lost one of its best: Michael Hylton, the Mike behind Mike's International. We don't have a better picture of Mike's on file - we took this one when Mike's was temporarily shut down after a fire in the building above. Our best wishes and thoughts go out to MIke, his friends and family. "Would you mind posting this funeral/viewing info, and saying a few kind words about Mike on ATP? As the founder and owner of a longtime PLG eating institution, Mike and his family have always been friends of those who want to make a difference in our hood. Mike's has historically served as a base for the annual house tour and the restaurant could be counted on to make contributions to various causes (LMA, PPA, etc.)" 5:00 p.m. – 9:00 p.m. Service will be held at 7:00 p.m.
Funeral Mass: Tuesday, October 9th at 9:30 a.m. Bet. Bedford Ave. & Rogers Ave. The Price is Right on Lefferts Ave... ? In our humble opinion, this is a super cute house. Lefferts Ave. is lined on one side with 1920s (or 30s? ), two story bungalow-ish houses, similar to those found on Maple I. 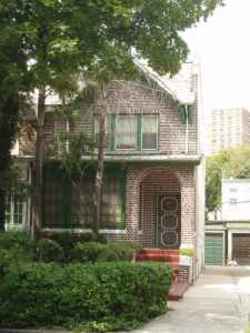 We appreciate the open feel of these houses as well, as they're more light-filled than most brownstones and many of them are equipped with built in dressers and stuff. We do not know the condition of this house, but we do know one thing: there's some price confusion out there. One ad has the price as $595K. Another has the price at $770K. That's a giant difference. We hate to beat the same drum again and again, but we believe that the big firms do a much better job marketing homes in PLG. That sort of price discrepancy is ridiculous, and, based on the ad, our guess is that the broker handling the property will not co-broke. Poor organization and limits on publicity do not do right by the seller. We're all about the little guy getting his/her piece of the pie, but it shouldn't be to the seller's detriment. Things to Do on Flatbush Ave. Sometimes, like many, we find ourselves all dressed up on Flatbush with nothing to do. Those days are over, for we may now smell on Flatbush Ave. Finally. Take some time out to stop and... smell. 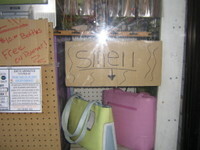 We're not sure exactly what this sign is pointing at, but we assure you that if you do choose to smell in this location, you will not be disappointed. Sign can be found on Flatbush, west side, near Winthrop. PLGers Featured in "The Hunt"
Some PLG newbies were featured in the NYTimes series "The Hunt," wherein NYC residents' abilities to stalk and kill real estate are put on display. Apparently, this duo was taken in by the opportunity to live in "green" quarters and bolster PLG's CSA. The couple passed up Sunset Park and Kensington for PLG - funny, we made the same choice a few years back. Enjoy the hood, newbies. Should you see Dara and Darren on the street, congratulate them on their new found fame.